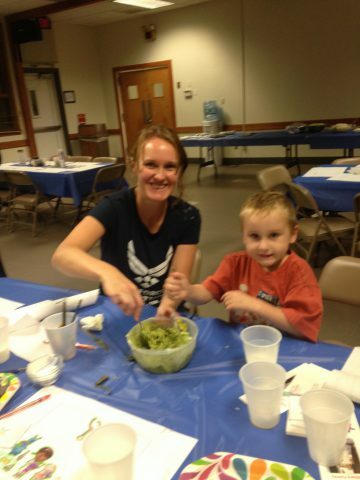 On October 9th, The Family Dinner Project and Blue Star Families came together at Hanscom Air Force Base in Bedford, Massachusetts for a Community Dinner filled with food, fun and conversation about things that matter for military families. Blue Star Families was formed by military spouses in 2009 to create a platform where military family members can join with civilian communities and leaders to address the challenges of military life. Today the organization serves more than 100,000 members around the world. Here, Executive Director of The Family Dinner Project Lynn Barendsen and Deputy Director of Membership for BlueStar Families Belle Poppenberger chat about the evening and this evolving collaboration. So how did this unique joint effort come about? Lynn: Through my work on the Good Project at Harvard, I’ve had the pleasure of meeting Chris Marvin of Got Your 6. I told Chris about The Family Dinner Project and happily, he put me in touch with Blue Star Families. 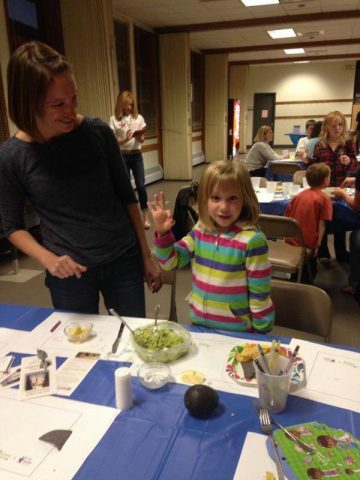 Belle: After hearing about the Family Dinner Project, I went to their amazing website and I joined their Food, Fun and Conversation: 4 Weeks To Better Family Dinners program right away for my own family. I was blown away and wondered “how could we bring these resources to military families?” Although military families experience unique challenges, we also face the same challenges that civilian families have and we wanted to customize this collaboration so that it addressed all of the needs of our members. 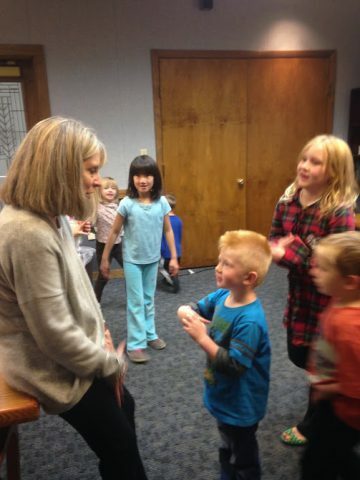 Lynn: The event at Hanscom was then the natural evolution of the first conversations between Blue Star Families and The Family Dinner Project. 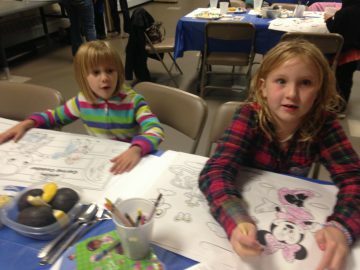 Early on, I described our Community Dinner events: gatherings where families come together to cook, talk and have fun. During these dinners, families share challenges and tips, and learn from each other. Belle and Megan Glynn, Director of Membership and Programs for BlueStar, were immediately interested in learning more, and we decided to try our first dinner together. Did anything surprise you at the event? Lynn: Belle and I met early on the base to cook and over those several hours we talked about the goals and missions of both Blue Star Families and The Family Dinner Project; our families; where we grew up; our interests in and out of work; and more. We listened to music and the time flew— the work never feeling like “work.” It was a powerful reminder of the bonding that can take place in the kitchen. And what happened with us is what can happen with families, before, during and after dinner. Cook and clean yes, but also chat about big and little topics, build (or rebuild) trust and enjoy each other’s company. 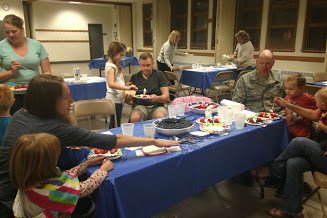 What are some unique challenges military families face around dinner? 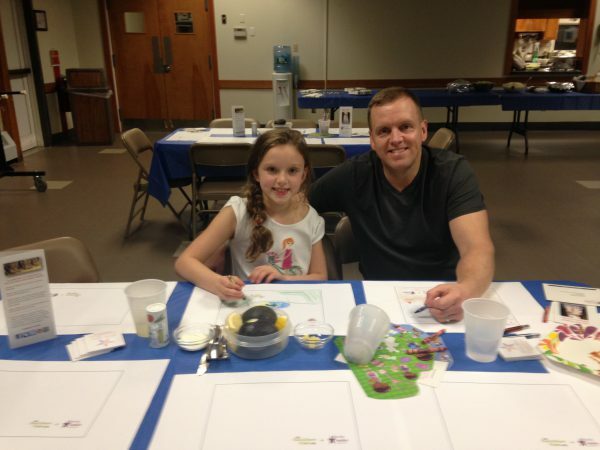 What ideas did the families come up with at the community dinner that might help other families, both military and civilian? 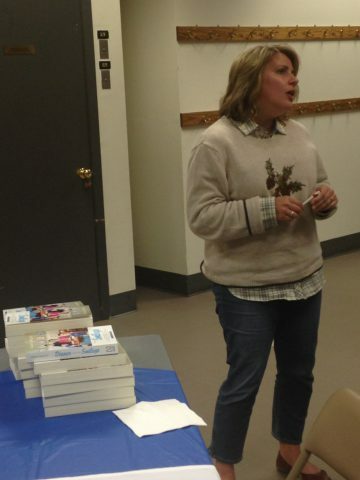 Lynn: I was blown away by how organized some military families are. I feel pretty good when I can manage a rough schedule for one week – but there were folks at our dinner who plan a month in advance! A good discussion about what to do with leftovers if you cook too much one night ensued. For instance, taco ingredients (which we had plenty of that evening) transform easily into chili that can be frozen. We also shared ideas about how to keep antsy kids at the table longer using games and conversation starters or, alternately, letting them run around in productive ways (whipping cream for dessert!) to get rid of some of that extra energy. Belle: One of the military spouses enjoyed the event so much that she is considering getting trained to facilitate a community dinner as a volunteer! That’s the kind of “pay it forward” spirit that is so prevalent in the military community. 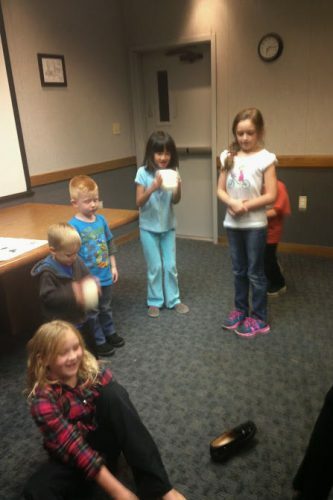 Our fearless founder Shelly London preps the troops for making whipped cream! And, finally, eating said whipped cream with berries for dessert. What are the plans for future collaboration? Belle: Our event at Hanscom Air Force Base is part of our Beta test for this collaboration. 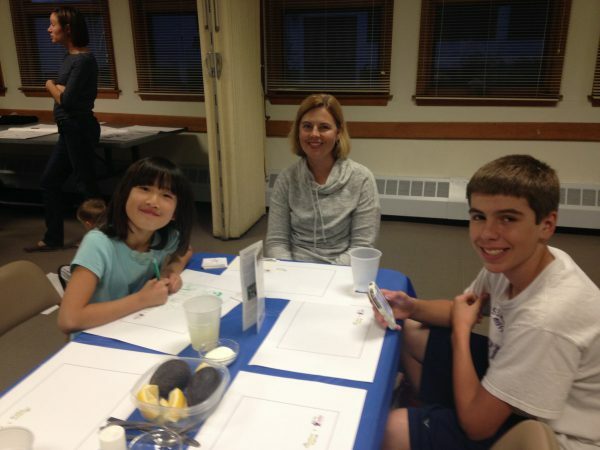 Our hope is to fine-tune more events here in Massachusetts because of the proximity to The Family Dinner Project group. We don’t have a large number of active duty families in the state, but there is a huge National Guard and Reserve population. From here we would love to branch out across the country training military family members to facilitate these great community events! Lynn: In the short time we’ve been working together, I have learned so much from this collaboration. With Belle, Megan and Sarah Smiley’s help, I hope to bring the tools and tips of The Family Dinner Project to as many Blue Star Families as possible. Military families have done so much for us all; to be able to contribute something small in return is an honor and a privilege. Oh, and let’s be honest – it’s a lot of fun! Special guest at the event author Sarah Smiley standing ready to sign and give out free copies of her wonderful book, Dinner with the Smileys! For more information on this terrific collaboration and resources specific to military families, visit our Blue Star Families page.